I was up early this morning and decided I was going to bake something before leaving for work. 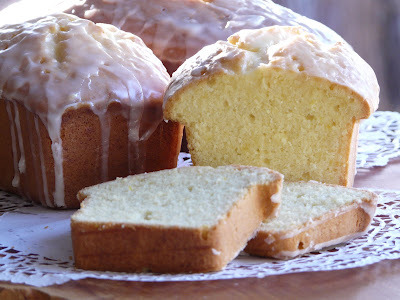 Did a search on Foodgawker and found an appealilng photo of a Lighter Airy Pound Cake. The photo and recipe were posted on Eat My Cake blog. The original recipe which makes two cakes was posted by the New York Times. This is the recipe that I used. I made one large loaf and two small loaves. I also made a lemon glaze using the juice from one lemon and powdered sugar. This cake has a nice texture but it is more time consuming to put together than similar cakes because the egg whites are beaten separately from the yolks. 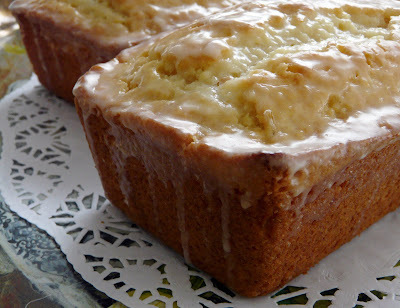 I actually prefer my regular lemon loaf recipe over James Beard's. Adapted from Beard on Food. Note: I made a glaze from the juice of one lemon and icing sugar (Powdered sugar) and drizzled it over the still warm cakes. 1. Preheat the oven to 350 degrees. Butter and flour a tube pan. Sift the flour onto waxed paper and then spoon it gently back into the sifter, adding the baking powder and a good pinch of salt. Sift the mixture twice more, each time spooning it lightly into the sifter. 2. Using an electric mixer, whip the egg whites until they hold soft peaks and then gradually beat in 1 cup of the sugar, 2 tablespoons at a time. Transfer to a bowl. 3. Fit the electric mixer with a paddle attachment and cream the butter until light and fluffy. Beat in the remaining 3/4 cup sugar until fluffy. Beat in the egg yolks until light and lemon-colored and then add the Cognac and zest. 4. Gradually fold the sifted flour mixture into the butter-egg mixture. Fold in the beaten egg whites just until the batter is smooth. Pour batter into the prepared pan and bake in the oven for 1 hour or until a toothpick pierced in the center comes up clean. Makes 1 cake. 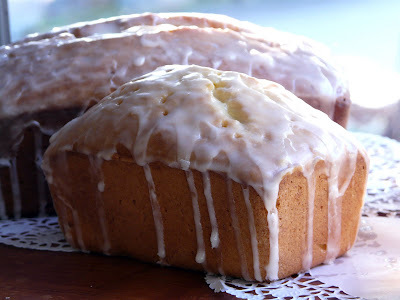 This recipe is my standard lemon loaf cake. One I have been making for over 20 years. Note: This cake is also nice with the addition of poppyseeds. Preheat oven to 350°F. Light grease 2 large loaf pans or a combination of large and mini. Into large mixing bowl, sift together flour, baking powder, salt and sugar. In separate bowl, blend butter, eggs, milk, rum, lemon zest and vanilla. Add the liquid ingredients all at once into dry ingredients. Blend just until moistened. Turn into prepared pans and tap pan to smooth out mixture. brush with lemon glaze while still warm. Your cakes look oh, so good. I'm very fond of lemon and the glaze is the perfect finish. I go for the one bowl method too. Your recipe is better than James Beard's?! I'm gonna have to give it a try. I think your recipe looks better too! I love lemon and poppy seeds together. Hmmmm I have to agree, your recipe looks much better!!! YUM! Yum...I could sit down with a slice and a cup of tea right now...before dinner! Desserts should come first! Looks beautiful, but if you have another favorite, then that's the one I'm going with too, grins. This looks like such a beautiful pound cake! Monique, you are so right. Lemon Loaves really are a classic. Cathy, I think that a glaze really makes any lemon loaf. Coach J, I would never say my favourite was better than James Beards. I would just say that I like another one better. Susan, I love poppy seeds too. Kate, "Desserts should come first". I like the way you think. A Bowl of Mush, - me too. Do I really have to put rum or can I substitute any liquid with it. I don't take anything with alcohol. Thanks! Anonymous, No you don't have to use the rum. 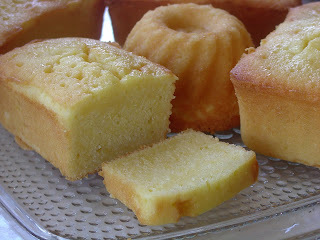 Just increase the milk by 1/2 a cup in the cake and increase the fresh lemon juice in the glaze. I've even substituted sour cream for some of the milk in this recipe. I'd be happy with either one (though I have to say that the one with rum appeals just a bit more...) I think you've forced me to do a taste test of my own! Gorgeous photos, Ann! !